Lamb is one of those meats that you either love it, or you hate it. Folks that don’t like it usually suggest that the meat is too gamey for their taste. This can be true in some cases, but not all. It depends on where you get your lamb. American lamb is far less gamey than it’s cousins in Australia and New Zealand. This is because in most of the U.S, lamb is grass fed, then grain finished, meaning that it’s fed grain at the end of its life to fatten it up before processing the animal, which produces a less gamey flavor. Lamb from New Zealand and Australia is grass-fed throughout its life and tends to have a stronger lamb flavor. In other words, if you are looking for milder tasting lamb for dinner, buy American. Personally, I like the gaminess of imported lamb, because I prefer to eat my food the way it is supposed to naturally taste. 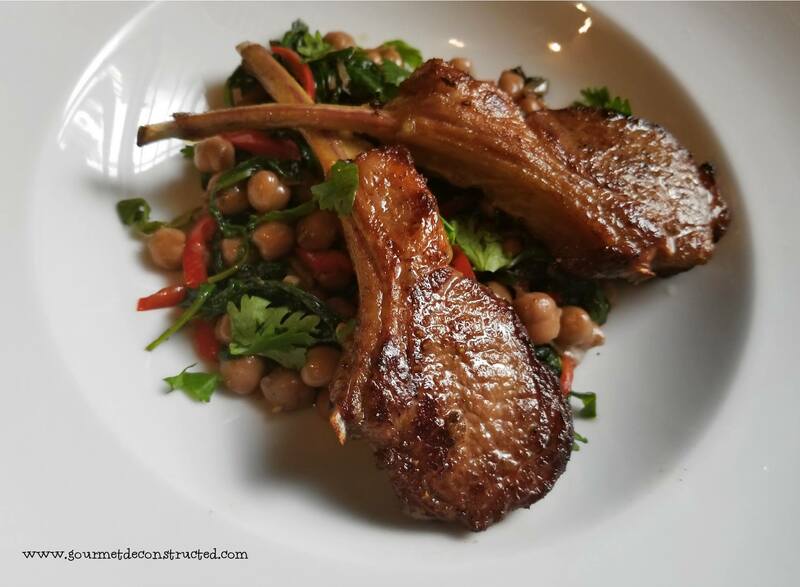 This is why I chose to use New Zealand lamb chops for this recipe. Additionally the gamier meat seems to work well with the complexity of fragrant Indian spices, without being overwhelmed by it’s strong flavors. “Madras curry” gets its name from the city known as Madras when English merchants arrived there, it is now known as Chennai. Although it uses Indian spices, the term Madras is not used in India. In fact,”Madras curry” was invented by Britain’s Bangladeshi restaurants in the 1970’s. There are many variations of it but I chose to create a bit of spicy version for this recipe (heavy on cayenne). You will end up with a little over 2 cups of this seasoning which you can seal it in a container for later use. Sous vide edge to edge perfection! This recipe is prepared sous vide, but feel free to cook the lamb chops the traditional way as per conventional directions. Some of the best results I have experienced with lamb is cooking it with the sous vide method because you get consistent results every time. 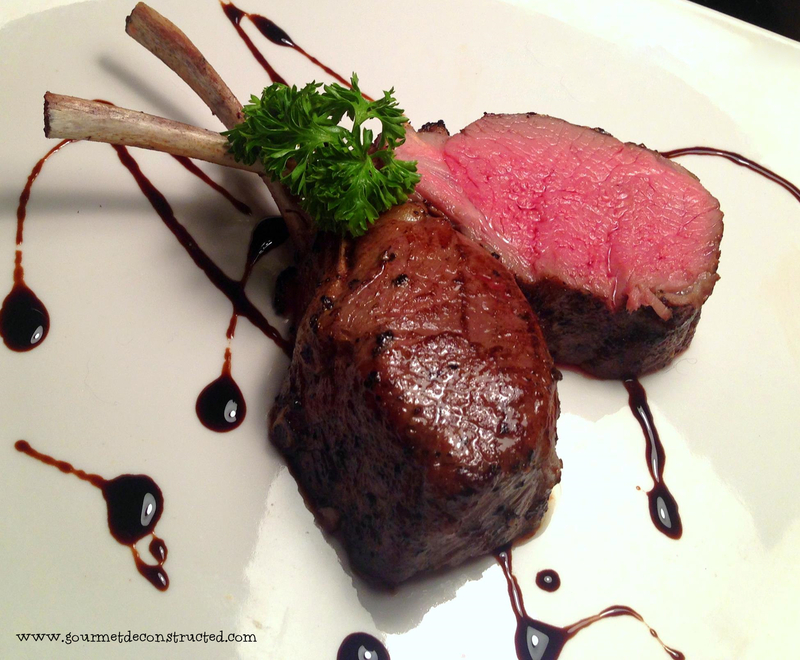 It works especially well when you are cooking a larger cut of lamb such as a rack or the leg. The results are edge to edge perfection (pictured above) and no more over cooked meat. Enjoy! First prepare the spice mix; Place the coriander, cumin, fenugreek, mustard and fennel seeds in a dry skillet over low heat. Roast the seeds gently, shaking the pan occasionally, until they begin to pop. When about half the seeds have popped, add the peppercorns, cardamom, cloves, cinnamon, turmeric, nutmeg, ginger and cayenne. Continue to heat and stir gently until the mixture gets hot, but not burn. Pour into a dry herb blender, food processor or mortar and pestle. Grind into a powder. Let the mixture cool, then transfer to an airtight container after you use it and store in a dry place for up to 6 months. Coat the lamb chops with a light coating of the oil, then season generously with the Madras curry powder, cover and place into the refrigerator for 6-12 hours. When the lamb is ready, preheat the sous vide bath to 134F. Season the lamb with salt and vacuum seal them in a single layer (use 2 bags if you need to) and place into the sous vide bath for 3-4 hours. during the last 20 minutes of cooking the lamb, prepare the spinach. Heat the 2 tablespoons of the ghee in a large skillet over medium high heat. Saute the shallots and bell peppers for 5-7 minutes until softened. Add the cumin seeds and garam masala and cook for 1 minute, stirring frequently, then add the garlic and cook until fragrant, about 30 seconds. Add in the chick peas and simmer for 3-5 minutes. Begin to add the spinach, in stages, adding more as the leaves begin to wilt. Stir in the rest of the ghee and season with salt and pepper then cook an additional 2-3 minutes. Remove from the heat and cover to keep it warm and set it aside. Take the lamb chops from the sous vide bath, remove them from the bag and pat dry with paper towels. At this time you can season with a bit more curry if you prefer. Pour the remaining grapeseed oil into a heavy bottom skillet over medium heat. Sear the lamb chops 2-3 minutes per side until a crust forms then remove from the pan. On four plates, add to each some of the spinach/chickpea mixture, 2 lamb chops, and garnish with cilantro and serve. Posted on December 15, 2018, in Lamb, sous vide and tagged bangladeshi food, british food, Chennai food, chickpea curry, chickpeas, cilantro, cookbook, garam masala, gourmet deconstructed, Indian food, indian spices, Lamb, lamb chops, madras curry, mastering the art of sous vide cooking, rib chops, sous vide, sous vide lamb, spicy, spicy curry, spinach. Bookmark the permalink. Leave a comment.